On 23rd March, I was conducting a small group of tree enthusiasts around my garden at Calltuinn (NC137319). As we came down through the old downy birches on the ridge above the drive, Stuart Belshaw noticed something unusual lying loose in the leaf litter. 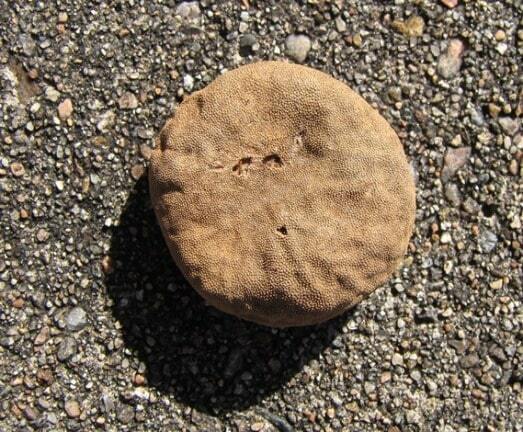 It was disc-shaped, about 3cm in diameter, with a tough warty skin. I recognised as a false truffle Elaphomyces sp., but had to take it to Bruce Ing for a definite name, based on spore characters. It was Elaphomyces granulatus, described as ‘uncommon’ in the works on fungi, although it has been previously recorded in Assynt, by the late John Blunt, at Nedd, Glenleraig, Drumbeg and in the Inver Woods. A small group of fungi, the false truffles are usually placed amongst the ascomycetes. They are completely subterranean, and inedible, unlike the true truffles (so no fortunes to be made out of them locally). They are sometimes parasitised by a striking club fungus, with yellow stalk and shiny brown head, Cordyceps longisegmentis, closely related to the better known scarlet caterpillar club C. militaris. On a memorable occasion, on 30th November 1995, Pat and I found a clump of C. longisegmentis under Scots pines, near Eas Allt Horn, at the eastern end of Loch Stack, and collected a specimen. We were sent back to the site, which is a considerable way off the road, by John Blunt, to collect a further specimen of its host, which indeed proved to be this false truffle.